MainAll NewsDefense/SecurityJewish suspects to wear ankle bracelets? Jewish suspects to wear ankle bracelets? Israel's security apparatus weighs taking controversial measure in order to eradicate violations of administrative detention orders. In the wake of the deadly arson attack in Duma, Israel's security establishment has increased its use of administrative detention orders against Jewish extremists. But those orders, which stipulate house arrest or expulsion from Judea-Samaria, are frequently violated and the security establishment is now considering forcing such suspects to wear electronic monitoring bracelets. According to an Army Radio report, the measure was brought for discussion two weeks ago among senior officials from the Israel Security Agency (ISA or Shin Bet), the IDF, and the State Attorney's Office. 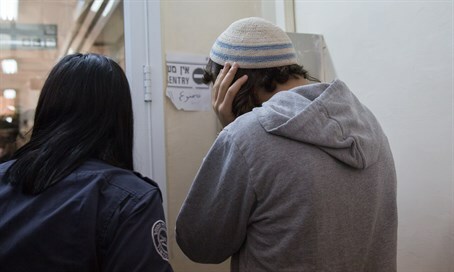 Implementing the measure would stipulate that Jewish terror suspects placed under administrative detention also be subject to electronic surveillance, thus making it easier to determine breaches of the administrative orders. Monitoring the suspects would also enable the security establishment to be certain of their whereabouts at any given time with the goal of keeping the suspects out of certain areas and preventing their involvement in nationally-motivated attacks. The move is expected to face serious objections from the suspects' lawyers as well as legal rights groups. Electronic monitoring is only applied in Israel in cases after an indictment is filed and where there is evidence to warrant its use. To apply it for suspects under administrative detention - who are detained without trial - would appear problematic. In addition to electronic monitoring, the security establishment is also weighing increasing punishments for those found violating their administrative detention order.